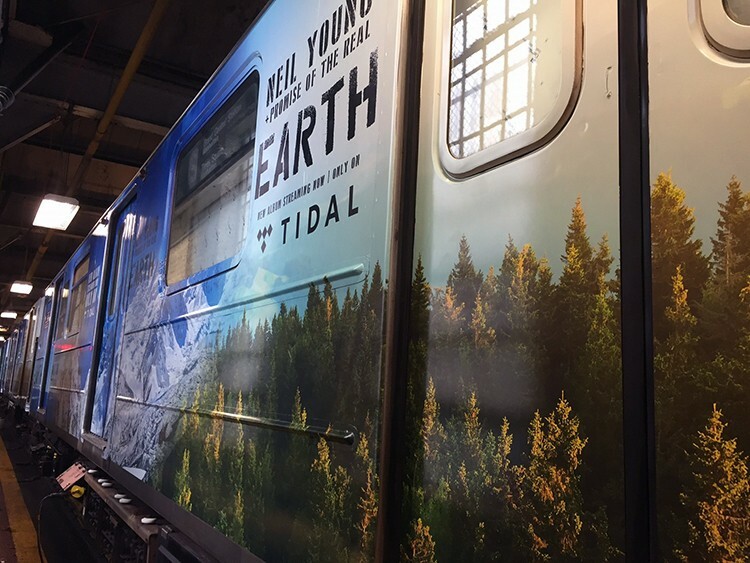 Neil Young's new album EARTH will soon be riding the rails on New York City's subway. That there fervent green is just darn right beautiful Eh ! 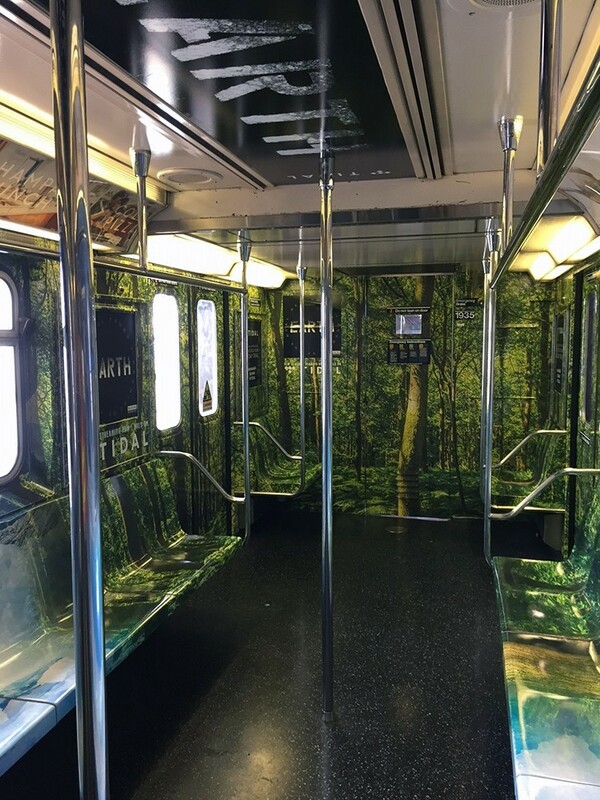 Continued to be amazed by the Mr Earth , Mr Soil train and his use of images . A simple question there clones ...... How much jet fuel carbon has the man that wears an Earth T-shirt spewed into the fervent green this summer..... and in his lifetime ? Accountability he preaches to Monsanto , accountability he preaches to Canada and has the nerve to tell us to Honour our Treaties . How's about you honour your own Americana constitution , and drop your guns ! Until then Neil is just another snake oil salesmen ..... on a long Missouri boat ride ! @Robert - pay no mind to "EH". He seems to be some type of robo-troll who shows up periodically here on some sort of jihad rant. Don't you just love the incoherence of "honour your own Americana constitution , and drop your guns !"?! Every good Canadian knows that Americans actually have the right to bear arms enshrined in the 2nd Amendment. eh, indeed. Thrasher ...... Thank-you ! Good to see ones true colours . Your memory appears to be as long as your front teeth . Not too long ago Mr. Thrasher , you were plastering grease on the wheels of the bandwagon preaching to Canadians on how we should Honour our Treaties . You may dismiss my comments as negative and " troll " like , fair enough . The free world as I know it , allows for such discussion . Your world allows carry and hold , carry and hold guns to a Republican Convention . Now , ain't that there an interesting paradox Eh . Guns at a gathering where everyday people should be free , less intimidation . Enjoy your 2nd amendment and your organic apples . Neil Young .... the music , is a passion of mine , like many others . The politics of preaching in an.... America knows what is best for the world .... is tiresome . Hey Robert Bard , I may express thoughts not in yer wheel house . I will respectfully disagree with your comment in reference to my use of good ole Canadian Crude vs that of a lad that wears an Earth T-shirt and talks like a guardian of Mother Earth . Not sure how it works in your Americana , but up here in the True North Strong and Free ....... we have have access to something called .....the freedom of information , a great tool to hold everyone accountable to their words and fuel consumption . Won't bore ya with the details , but yer way off track . I used a gas powered push lawnmower this weekend , long after feeding the deer , and other earthly animals . From what I can figure , I'd have to mow a lawn to Pluto to burn as much Canadian Crude as Mr Earth burns in one trip of his earthly jet from Brussels to France . The mans music is real , the rest is open for discussion , or is it only for those that pay no mind to others ?